The Applaws Sardine Pots are no longer available. A suitable alternative is Applaws Cat Mackerel & Sardine. The Applaws Sardine Pots can be served in the dish in which the wet food is packed. Each pot is packed with fresh mackerel and sardine and is supplemented with broth and rice. Each portion is a natural source of taurine. This nutrient supports the condition of the eyes and is beneficial for the heart. This flavour is also available in a convenient multipack. You can find this here. Sardines (48%), fish broth (35%), mackerel (12%), rice (5%). 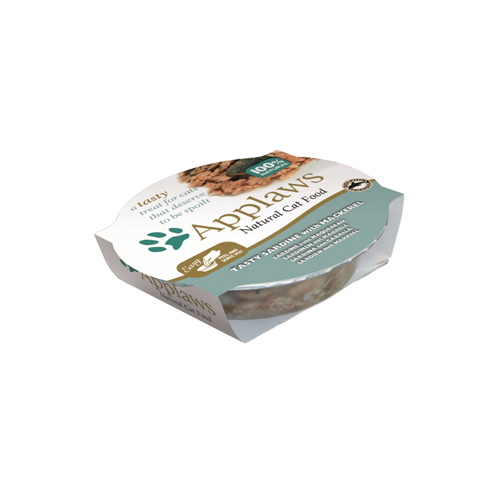 Have you used Applaws Cat Food - Sardine & Mackerel Pots before? Let us know what you think about this product.